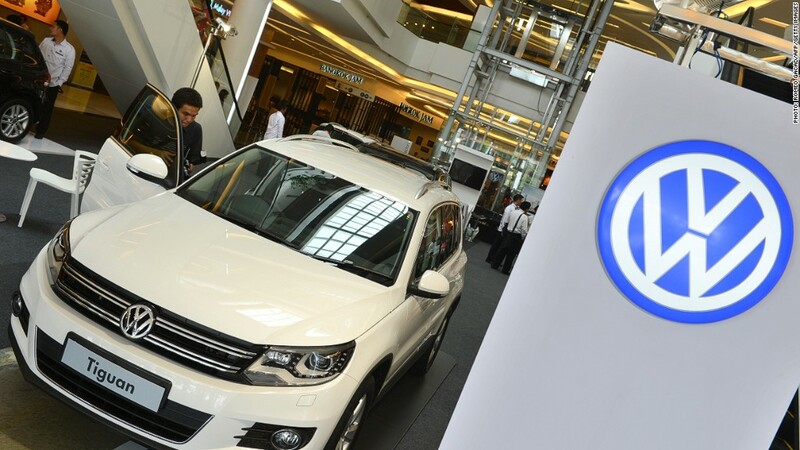 Volkswagen's costly lie has left the giant automaker in crisis. It has also left its customers feeling confused, cheated and steaming mad. The emissions scandal affects nearly 500,000 diesel Volkswagen and Audi cars in the U.S. alone -- and millions more around the world. The scandal came to light when the EPA said Volkswagen had cheated on smog tests. U.S. regulators have ordered the company to recall the cars at issue. But VW hasn't done that yet, nor has it said how it will get the cars to comply with the law or how it will compensate customers. Bottom line: Who knows what comes next? CNNMoney has heard from many Volkswagen customers in recent days. Here are some of their stories. Kristen Taylor, a freshman at the University of Maine at Farmington, bought her first car 18 months ago. She had saved $19,000 working summer jobs to buy a blue 2011 Jetta TDI with a sunroof. 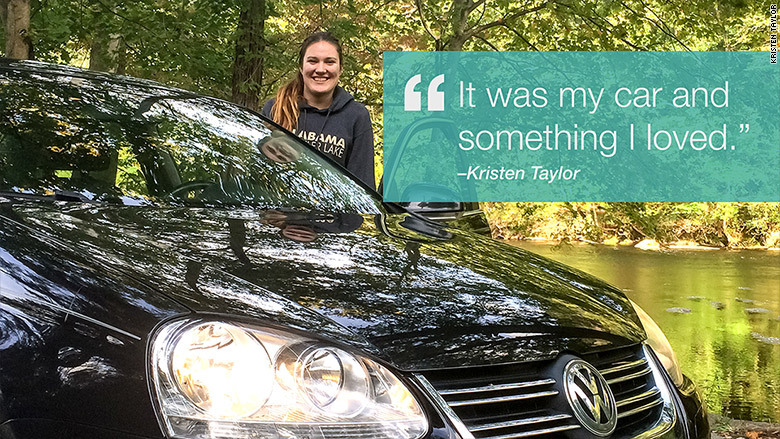 Taylor researched her options before deciding to buy a diesel car because of its clean impact on the environment. Taylor, 18, bought the car with about 10,000 miles on it and added about 18,000 before leaving it at home when she went to school. The car was being detailed to be resold when the Volkswagen news broke last week. Experts say the resale value of the cars will likely take a hit -- at least until more is known about how VW intends to clean up the mess it has created. Now Taylor, who needs the money to pay for school, will have to figure out another way to pay for classes. The resale offers she has received so far ranged from about $1,000 to $5,000. Before the scandal broke, she was getting offers that would've paid for more than a semester of school over $10,000. "But it's more than just paying for school," Taylor said. "It was my car and something I loved." She added: "I'd never have bought anything other than a VW and a diesel, and now that's all blown up." 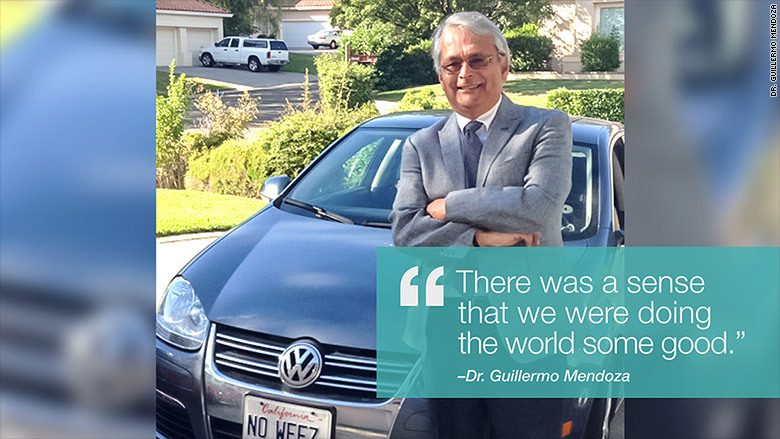 Dr. Guillermo Mendoza, an allergist at Kaiser Permanente in California, owns a Jetta TDI that he bought in July 2010. "There was a sense that we were doing the world some good," Mendoza said. "To have it flip 180 degrees is just shocking. I haven't computed the cost to society now that I'm spewing out Nitrous oxide but it's definitely an ironic twist." As a doctor who treats people with asthma, he feels funny about driving a car that's suddenly been tagged a polluter. Mendoza, whose car has a personalized license plate that reads "No weez," said he was inspired to try a diesel car for the first time because of the promise of clean fuel. He said he had planned to keep his car, which currently has 65,000 miles on it, for the rest of his life. Now that may not be an option. 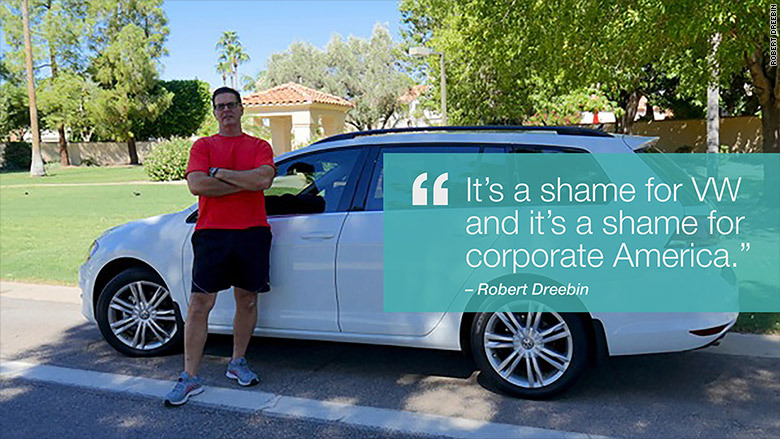 Robert Dreebin, a motion picture recording engineer, bought a 2015 Volkswagen Golf in July to get better mileage on his commute from Phoenix to Los Angeles without belching out pollution. Dreebin's car only has 3,000 miles on it. Now he's worried that any changes that have to be made will compromise its performance, power and miles per gallon. He is a long-time fan of diesel vehicles and has owned four of them. He values their longevity and is upset that Volkswagen didn't deliver on what was advertised. "It's a shame for VW and it's a shame for corporate America," Dreebin said. "People already have such skepticism about the labeling of products and now this just adds to the sense that corporations don't have consumers' best interests in mind."